Draft: 2013, Los Angeles Dodgers, 8th rd. In his Major League career has played 3B (26g, 14gs), C (4g) and 1B (2g, 1gs)...in the 11-inning, 3-2 Dodgers win on 7/30/17 became the first player in franchise history to produce a game-ending hit in his first career plate appearance (2-run double off SF's Albert Suárez)...in 2015 participated in the Sirius XM All-Star Futures Game at Great American Ball Park in Cincinnati...in 2013 and 2015 was an MiLB.com Dodgers Organization All-Star...was a mid-season All-Star in 2014 (Midwest League), 2015 (California League) and 2016 (Texas League)...before converting to catcher as a professional was an elite shortstop in college...at the University of Georgia, where he was a roommate and teammate of current Reds LHP Alex Wood, established career and single-season fielding percentage records for that middle infield position...appeared in 212 career games for the Bulldogs, including 211 starts at shortstop. Attended Marist High School in Atlanta, where he played baseball and football...at the University of Georgia appeared in 212 games, including 211 starts at shortstop, and hit .308 with 63 doubles, 7 triples, 18 HR, 168 RBI and 11 stolen bases...holds the career record for fielding percentage by a Georgia shortstop (.968 in 1,045 total chances) and the single-season record for fielding percentage by a Bulldog shortstop (.978 in 2013)...ranks among Georgia's all-time leaders in games played, total bases, at bats, hits, doubles and RBI...as a junior and senior at UGA was named to the Athletic Director's Academic Honor Roll...in the hit movie The Blind Side made a cameo appearance as a high school quarterback. Spent most of the season at Class AAA Oklahoma City, where he produced 32 extra-base hits in just 79 games, but also made 39 apps during 3 stints with the National League champion Dodgers...made his first Major League Opening Day roster and made 30 apps for the Dodgers before he was optioned to Oklahoma City on 5/13...made 2 more apps for LAD during a second stint from 6/15-6/19, then appeared in 7 additional games as a September callup...for LAD played primarily 3B (26g, 14gs) but also made 4 apps behind the plate and 2 apps/1 start at 1B. Saw his first big league action and appeared in 20 games for Los Angeles hitting .300 (6-for-20) with a double and two RBI...made three different stints with the Dodgers...Recalled on July 28 for his first stint with Los Angeles and made his Major League debut on July 30 against the Giants and in his first big league at-bat, drove in the game-winning run with a pinch-hit, two-run double in the 11th inning off of Albert Suárez for his first career hit...became the first Dodger player in franchise history to earn a walk-off RBI in his first career plate appearance and according to Elias Sports Bureau, became the first player in 22 years to supply a walk-off RBI in his first Major League plate appearance, joining Tomas Perez who accomplished the feat with Blue Jays on May 3, 1995...according to Stats LLC., also became the first Dodger since Darren Dreifort to record a walk-off hit for his first career hit on May 27, 1994 vs. PIT (RBI single) and the first position player since Greg Brock, who recorded an RBI single on Sept. 5, 1982 vs. PIT, to accomplish the feat...Appeared in five postseason games and drove in a run in Game 3 of the NLCS against the Cubs...Appeared in a combined 92 games with Triple-A Oklahoma City and Double-A Tulsa, posting a .317/.375/.476 slashline with 23 doubles, one triple, 10 home runs and 56 RBI...saw majority of action at catcher (51 games), but also appeared at third base (29 games), second base (six games), first base (six games) and shortstop (two games)...Selected as Texas League Player of the Week for the week ending May 14. Appeared in a combined 78 games with Double-A Tulsa and Rookie-level AZL Dodgers, hitting .258 with 18 doubles, two triples, seven homers and 35 RBI...Spent majority of the season with Tulsa and was selected to the Texas League Mid-Season All-Star as he hit .296 with 11 doubles, two triple, three homer and 18 RBI along with a .342 on-base percentage in the first 39 games of the season...Hit a combined .309 (21-for-68) with six doubles, three home run and 29 RBI with runners in scoring position. Selected to play in the MLB All-Star Futures Game and as a Single-A California League All-Star, combining to hit .296 in 120 games with Rancho Cucamonga and Double-A Tulsa...Tied for ninth among all full-season minor leaguers with 40 doubles...also had seven triples, three homers and 66 RBI...Chosen by MiLB.com as a Dodgers Organization All-Star...Following the season, played for the Glendale Desert Dogs in the Arizona Fall League, where he posted .293/.323/.517 slashline with seven doubles, two homers and 13 RBI. Split time between Single-A Great Lakes and Single-A Advanced Rancho Cucamonga, combined to hit .284 with 21 doubles, five triples, two homers and 50 RBI in 93 games...Honored as a 2014 Midwest League Mid-Season All-Star, after posting a .310/.357/.441 slashline with 16 doubles, four triples, two homers, 35 RBI and nine stolen bases with the Loons. Selected as the MiLB.com Organizational All-Star, posting a .347 (58-for-167)/.386/.533 slashline with 19 doubles, four homers and 36 RBI in 41 games with Rookie-advanced Ogden in his first year of professional ball. March 28, 2019 Cincinnati Reds recalled C Kyle Farmer from Louisville Bats. 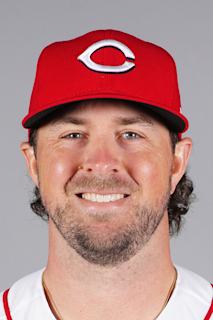 March 22, 2019 Cincinnati Reds optioned C Kyle Farmer to Louisville Bats. December 21, 2018 Los Angeles Dodgers traded RF Yasiel Puig, LF Matt Kemp, LHP Alex Wood, C Kyle Farmer and cash to Cincinnati Reds for RHP Homer Bailey, SS Jeter Downs and RHP Josiah Gray. September 1, 2018 Los Angeles Dodgers recalled C Kyle Farmer from Oklahoma City Dodgers. June 20, 2018 Los Angeles Dodgers optioned C Kyle Farmer to Oklahoma City Dodgers. June 15, 2018 Los Angeles Dodgers recalled Kyle Farmer from Oklahoma City Dodgers. May 14, 2018 Los Angeles Dodgers optioned C Kyle Farmer to Oklahoma City Dodgers. November 2, 2017 Los Angeles Dodgers activated C Kyle Farmer. October 24, 2017 Los Angeles Dodgers reassigned C Kyle Farmer to the minor leagues. September 9, 2017 Los Angeles Dodgers recalled C Kyle Farmer from Oklahoma City Dodgers. August 30, 2017 Los Angeles Dodgers optioned 3B Kyle Farmer to Oklahoma City Dodgers. August 23, 2017 Los Angeles Dodgers recalled Kyle Farmer from Oklahoma City Dodgers. August 13, 2017 Los Angeles Dodgers optioned C Kyle Farmer to Oklahoma City Dodgers. July 28, 2017 Los Angeles Dodgers recalled Kyle Farmer from Oklahoma City Dodgers. May 23, 2017 C Kyle Farmer assigned to Oklahoma City Dodgers from Tulsa Drillers. April 4, 2017 C Kyle Farmer assigned to Tulsa Drillers from Oklahoma City Dodgers. March 13, 2017 Los Angeles Dodgers optioned C Kyle Farmer to Oklahoma City Dodgers. November 18, 2016 Los Angeles Dodgers selected the contract of Kyle Farmer from Oklahoma City Dodgers. September 7, 2016 C Kyle Farmer assigned to Oklahoma City Dodgers from Tulsa Drillers. July 26, 2016 Tulsa Drillers activated C Kyle Farmer from the 7-day disabled list. July 21, 2016 Tulsa Drillers sent C Kyle Farmer on a rehab assignment to AZL Dodgers. May 31, 2016 Tulsa Drillers placed C Kyle Farmer on the 7-day disabled list. May 6, 2016 Tulsa Drillers activated C Kyle Farmer from the 7-day disabled list. April 29, 2016 Tulsa Drillers placed C Kyle Farmer on the 7-day disabled list. January 25, 2016 Los Angeles Dodgers invited non-roster C Kyle Farmer to spring training. June 12, 2015 C Kyle Farmer assigned to Tulsa Drillers from Rancho Cucamonga Quakes. May 8, 2015 C Kyle Farmer assigned to Rancho Cucamonga Quakes from Tulsa Drillers. April 30, 2015 C Kyle Farmer assigned to Tulsa Drillers from Rancho Cucamonga Quakes. March 6, 2015 C Kyle Farmer assigned to Los Angeles Dodgers. June 20, 2014 C Kyle Farmer assigned to Rancho Cucamonga Quakes from Great Lakes Loons. March 31, 2014 C Kyle Farmer assigned to Great Lakes Loons from Ogden Raptors. March 8, 2014 C Kyle Farmer assigned to Los Angeles Dodgers. June 17, 2013 C Kyle Farmer assigned to Ogden Raptors. June 16, 2013 Los Angeles Dodgers signed C Kyle Farmer.